Stop #1 for Summer Restaurant Week 2010! Located on the Lobby Level of The Liberty Hotel, Clink takes on the persona of the old Charles Street Jail, the base which the hotel was build around. Bars from original jail cells are seen throughout the L-shaped restaurant, separating diners from the open kitchen. We were seated at the first table/booth, up against the floor-to-ceiling windows looking out onto the hotel entrance. 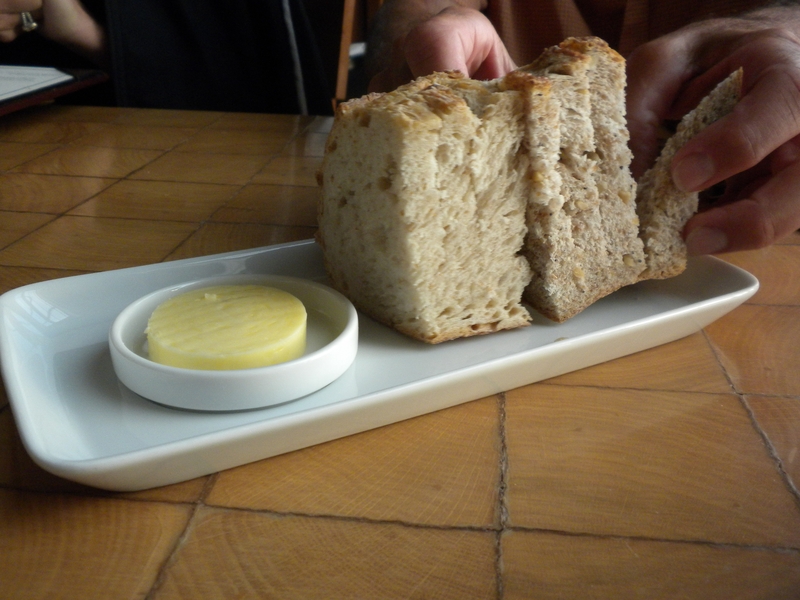 Bread: The multi-grain sourdough was served on a rectangular flat plate with a circle of butter. Points for the pre-sliced bread, and double points for the softened butter. It also helped that the bread was scrumptious! 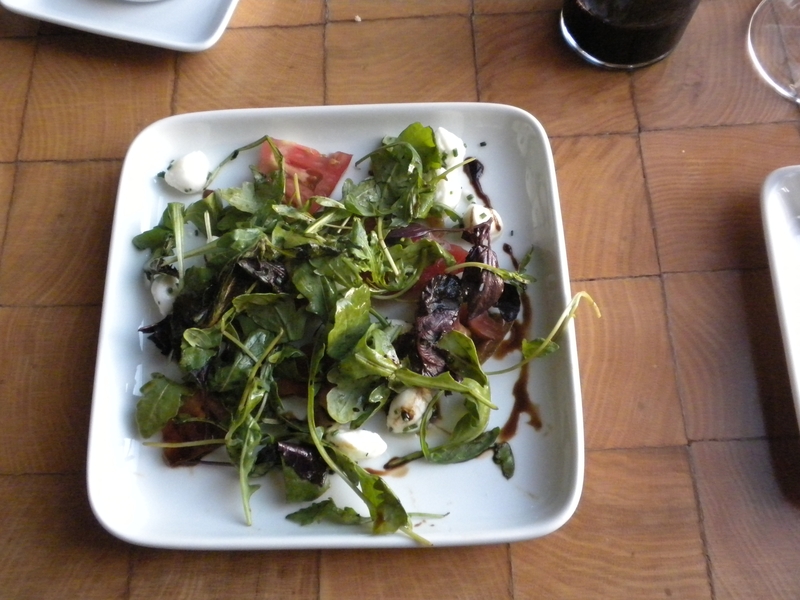 Presentation: The tomatoes & salad were served on a small square flat plate. I personally would have preferred the “Heirloom Tomato” dish have more tomatoes than greens, but salads usually skimp on the cheese & there were enough mozzarella balls to go around. The pork & onions were drizzled with a syrupy type of dijon – I love mustard and wish the dijon had a bit more of a bite, but the pork was cooked well, so no complaints. 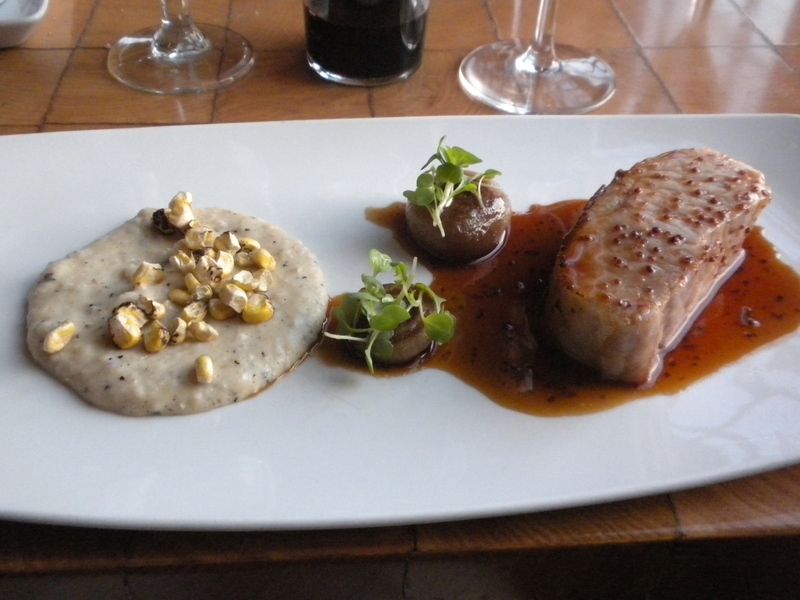 The grits were topped with grilled corn which added something different to the textured polenta-esque side dish. I was so excited once the warm cobbler was placed in front of me in its ramekin that I forgot all about trying to actually taste the brown butter ice cream. 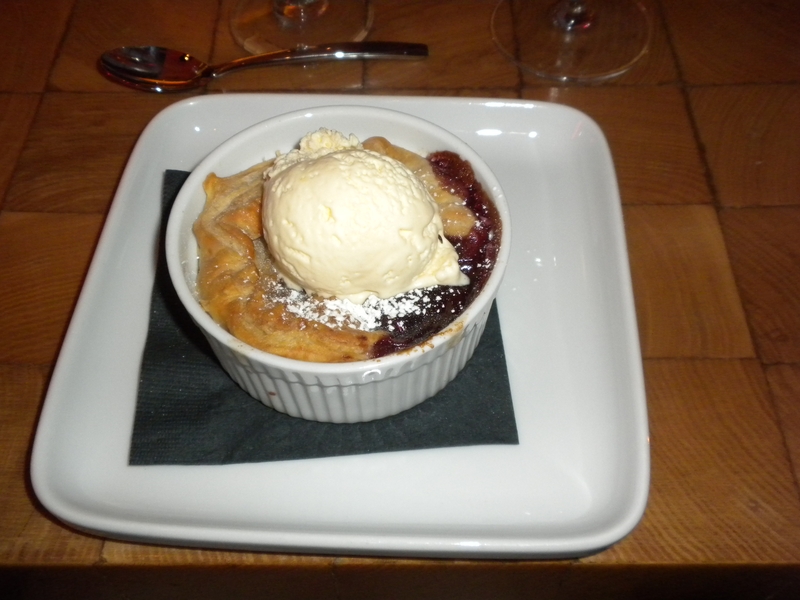 It could have been vanilla for all I knew, I was too delighted with light doughy crust & the fresh fruit! Bathroom: The bathroom was located down the hall, past the ballroom, rather than in the actual restaurant (which gives easy access to the bar patrons). Stainless steel, sleek, and clean. Multiple stalls & a full length mirror. There was even a table set up with individual cloth napkins for drying your hands. Well done for going green! Wait Staff: This was the disappointment of the evening as our waiter was not personable at all. When I asked him how the pork was prepared he responded with “In the oven.” Are you kidding me?! My parents, bf, and & I were so taken aback but laughed it off. Most waiters/waitresses would have understood what I was asking, and would have answered in more detail with an education response. Overall: Besides our odd waiter, we all had a great time. The wine (Malbec), while expensive, was smooth & just what I wanted. Our 1/2 booth had a great location with a view out of the grand windows. I do recommend Clink, more for the food & location in The Liberty rather than the “jail cell” appeal, which there could have been more of. The Perfect Bite: Pork loin. Slice of cippolini. Ground grits. Those creamy gritty grits!! I had to go get a snack after looking at that damn sourdough bread…nice!